许爱华, 孙继松, 许东蓓, 等, 2014. 中国中东部强对流天气的天气形势分类和基本要素配置特征[J]. 气象, 40(4): 400-411. DOI: 10.7519/j.issn.1000-0526.2014.04.002. XU Aihua, SUN Jisong, XU Dongbei, et al, 2014. 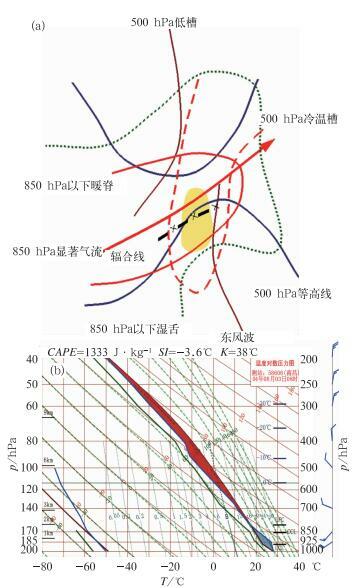 Basic Synoptic Situation Classification and Element Character of Severe Convection in China[J]. Meteorological Monthly, 40(4): 400-411. DOI: 10.7519/j.issn.1000-0526.2014.04.002. 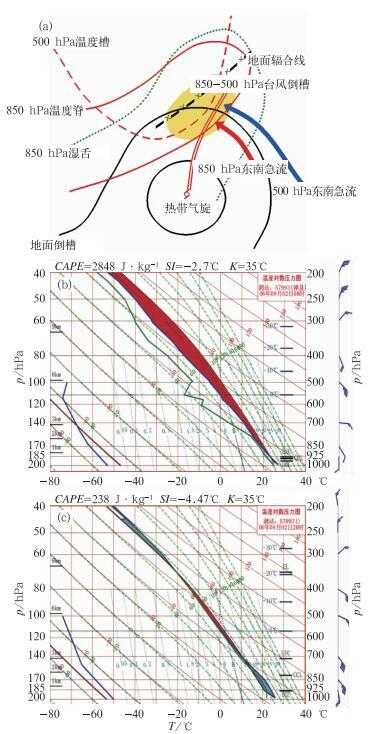 Abstract: Based on the synoptic environment analysis of about 100 severe convection cases in China since 2000 and the reference of related literatures, from the perspectives of the three essential conditions for the development of severe convection, namely the thermal instability, lift and moisture, five basic synoptic situation configurations of severe convection in China are proposed and expounded. They are cold advection forcing category, warm advection forcing category, baroclinic frontogenesis category, quasi-barotropic category and elevated thunderstorm category. The typical characteristics of the upper cold advection forcing category is that the mid-upper strong cold advection above 500 hPa strengthens and reaches the boundary warm convergence zone. The warm advection forcing category is characterized by trough with special structure moving over low-level strong warm and moist advection. The deep convection produced by the mid-lower layer convergence of cold and warm air features the baroclinic frontogenesis category. The quasi-barotropic category mostly occurs at the northern and the southern edges or the interior of summer subtropical high and the area with weak baroclinicity, where the dynamic forcing and the surface inhomogeneous local heating play major roles. The features of elevated thunderstorms are the southwest jet in 700-500 hPa lifted by boundary cold wedge and the instable energy is from above 700 hPa. 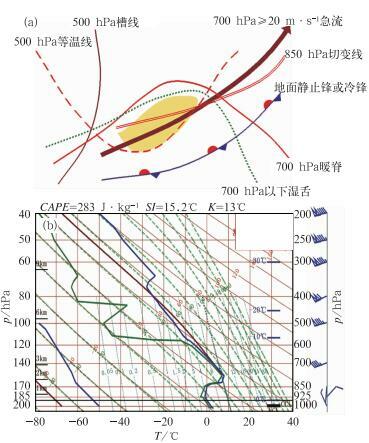 The classification based on the difference of the formation mechanisms can grasp accurately the synoptic characteristics, the situation configurations, the dynamic and thermal properties and the key points in analyzing short-term potential forecast, providing more technical support to further enhance the level of weather prediction. 陈立祥, 刘运策, 1989. 广州地区强对流统计特征和分类特征[J]. 气象, 5(2): 170-178. 陈联寿, 丁一汇, 1979. 西太平洋台风概论[M]. 北京: 气象出版社, 463-465. 丁一汇, 李鸿洲, 章名立, 等, 1982. 我国飑线发生条件研究[J]. 大气科学, 6(1): 18-27. 李彩玲, 陈艺芳, 蒋荣复, 2009. 热带低压远外围强对流天气的动力机制[J]. 广东气象, 31(5): 506-513. 梁必骐, 王安宇, 梁经萍, 等, 1990. 热带气象学[M]. 广州: 中山大学出版社, 158-176. 林确略, 彭武坚, 刘金裕, 2010. 影响桂东南东风波特征及其概念模型[J]. 气象研究与应用, 31(3): 5-10. 刘勇, 2006. 陕西一次槽前强对流风暴的诊断分析[J]. 高原气象, 25(4): 687-695. 王锡稳, 陶健红, 刘治国, 等, 2004. "5.26"甘肃局地强对流天气过程综合分析[J]. 高原气象, 23(6): 815-820. 王毅, 郑媛媛, 张晓美, 等, 2012. 夏季安徽槽前形势下龙卷和非龙卷型强对流天气的环境条件对比研究[J]. 气象, 38(12): 1473-1481. 肖文俊, 1990. 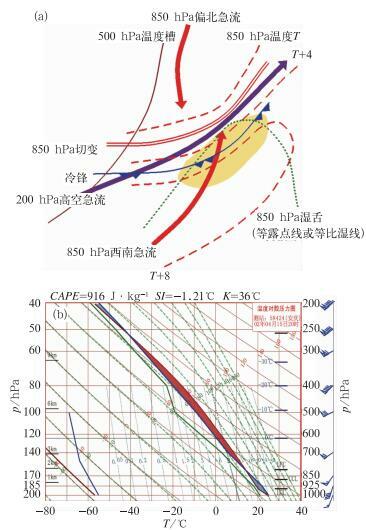 东风波天气区域分布与基本气流垂直切变关系[J]. 北京大学学报(自然科学版), 26(8): 334-339. 许新田, 王楠, 刘瑞芳, 等, 2010. 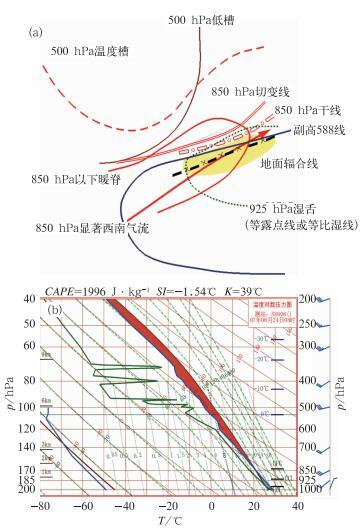 2006年陕西两次强对流冰雹天气过程的对比分析[J]. 高原气象, 29(2): 447-460. 张延亭, 2000. 低空急流诱发地面辐合线的一种机制[J]. 江西气象科技, 23(1): 14-17. 张一平, 牛淑贞, 席世平, 等, 2011. 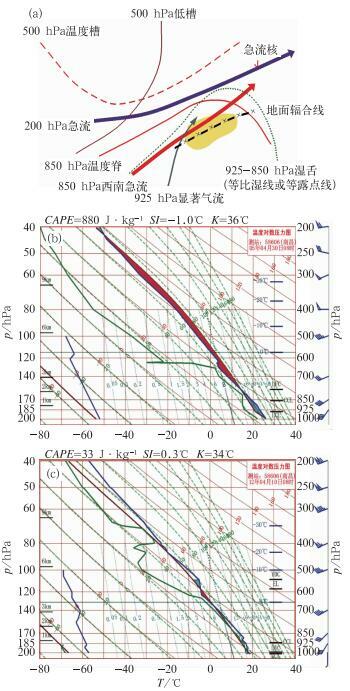 东北低涡槽后型河南强对流过程的天气学特征分析[J]. 暴雨灾害, 30(3): 193-201. 赵广洁, 2004. 影响广西的东风波特点[J]. 广西气象, 25(2): 8-9. 朱乾根, 林锦瑞, 寿绍文, 等, 1992. 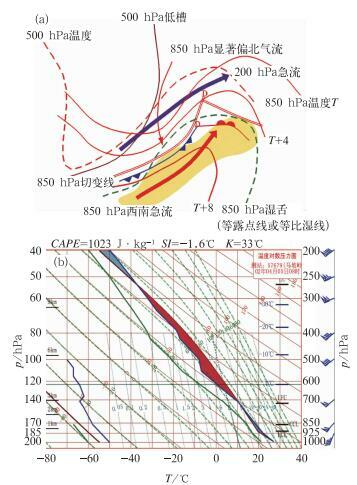 天气学原理和方法[M]. 北京: 气象出版社, 102-104.